The last time I wrote about, this, I was pointing to what looked like a single small faulted area in Dryden along the Caroline town line. That came from Figure 4.13 in the Geology section of the hydrofracking SGEIS (4.2 MB PDF). It, in turn, is based on a 1977 New York State Museum publication, which I guess I'll have to order. The researchers identified potential fault lines using remote sensing by satellite and low-flying planes. They then employed field methods, as well as magnetic fields and gravity measurements, to determine if those potential fault lines are indeed faults and if the faults extend down into Precambrian "basement," an indication that they could be seismically active. We only have about 200 years of data, and there is little sign that these faults are active, so I'm not entirely surprised that the DEC didn't consider this more recent information critical to the seismic section of their report. Unfortunately, though, faults are also a key pathway for gases and sometimes liquids to move up through rock formations we normally think of as solid. I tracked down Professor Jacobi's 2002 paper, Basement faults and seismicity in the Appalachian Basin of New York State and paid Elsevier $31.50 for it. It was worth that, and I'd encourage you to do the same (or track it down at Cornell) though it's pretty dense reading. You'll want to know what lineaments are in particular. How did they figure out where faults were without digging through the entire area? 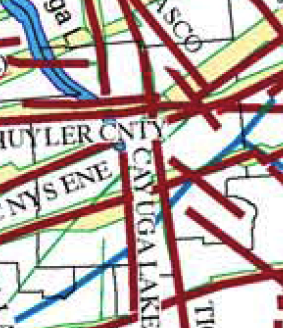 The faults running through Dryden are "suspected" - the researchers did not confirm their existence here through surface features or seismic testing. However, the paper strongly suggests that this approach to finding faults works, with tests in other locations. Appendix A talks about those suspected faults, many of which are suspected because of both the 'lineaments' from satellite imagery and geological, mostly gravitational, anomalies. 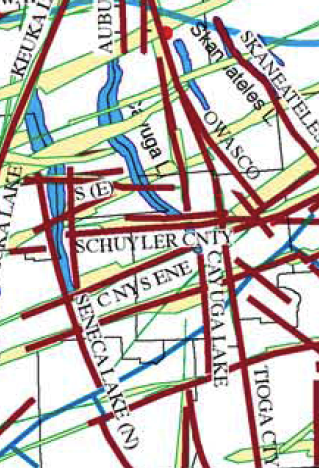 Some also run parallel to previously mapped faults. I'd encourage you to read pages 109 and 110 of the paper to find out more. Don't run out and buy earthquake insurance. There's not much if any history of these faults being active, though (if they're really there) they've been around for millions of years and we only have around two centuries of records. However, they make me think there's a lot more research worth doing before accepting the DEC's conclusions that we needn't worry about these issues with regard to gas drilling. More on that in my next piece about the SGEIS. I agree with the fact that there are many fault lines in New York and Pennsylvania. And that they link up together. What the DEC should realize that even with just a tremor the earth moves a few tenths of an inch. What's important to note is that when the tremor hits the point where the fracking water (that was forced down into the earth to help release the gas) a thing called liquification will happen. At that point the tremor could magnify and become many more tenths of an inch larger. I can fill my pool with a 5/8's hose in a few hours. Just imagine many of these liquification tremor cracks running the lenth of a fault line. That greatly increases the chances of the hydofracking liquids mixing with the good water we need.